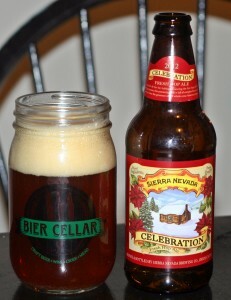 This beer is what I expect from Sierra Nevada, much better than the Floral IPA in my previous review. Celabration is a seasonal beer from Sierra Nevada available after the hop harvest and typically appears on sheves towards the end of the year and is sold in 6-packs of 12-oz bottles. Appearance is a nice red color with a thick tan head. The head may be a bit larger than normal as this Bier Cellar mason jar glass tends to expand the head on beer. Plentiful aroma of citrus hops, some floral and a bit of spice, very pleasant smell that draws you into the beer. Taste is a solid American IPA with plenty of hops but still well balanced with some sweet malts. Finish has a nice mix of sweet and bitterness. Overall this is a very nice IPA although it is a bit on the bitter side which I don’t really mind. 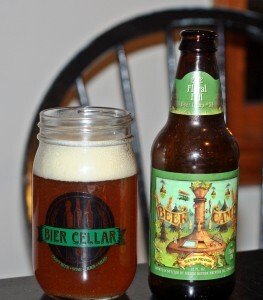 Brewers Description: Festive fresh hop holiday fun. The start of Celebration season is a festive event. We can’t start brewing until the first fresh hops have arrived, but once they have the season is officially under way! First brewed in 1981, Celebration Ale is one of the earliest examples of an American-style IPA and one of the few hop-forward holiday beers. Famous for its intense citrus and pine aromas, Celebration is bold and intense, featuring Cascade, Centennial and Chinook hops—honoring everything we have at Sierra Nevada. This one came from Sierra Nevada’s Beer Camp 12-pack which included 4 different varieties of beer. This was probably my least favorite of the 4. Pale orange color with thick white head. Aroma certainly has the floral character from the name as well as some piney hops. Taste is where this one fails with only a slight hop taste and significant bitterness that lingers too long. Beer seems over carbonated and just not as good as I expected. If Sierra Nevada puts out a Beer Camp 12-pack again in 2013 it is worth a try as you will get some good beer in it, unfortunately for me this was just an average IPA. 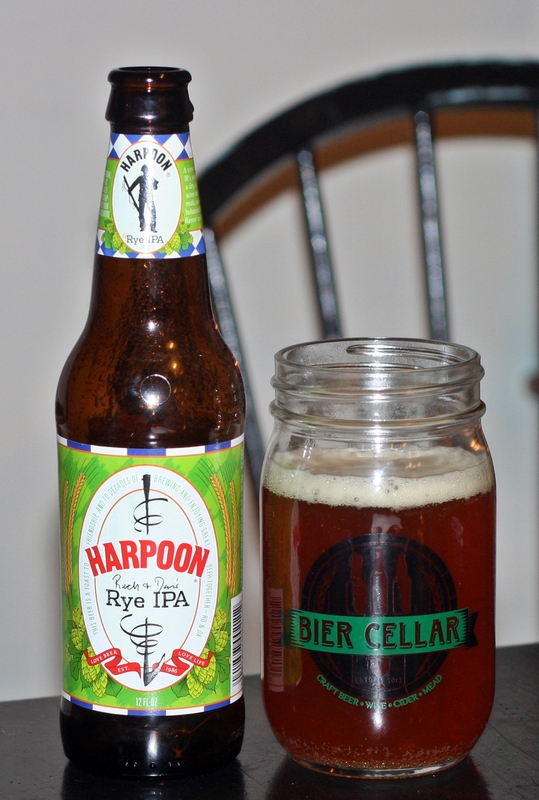 I first had this beer last Summer as part of a Harpoon variety 12-pack and was definitely impressed. I didn’t realize until recently that I never reviewed the beer so I had to grab another one and give a proper review. First difference you notice is the rye IPA is a bit darker than regular IPAs. Aroma is a very nice mix of citrus hops and spice from the rye. Overall this beer gets high marks even before I have tasted it. Taste follows the smell with some nice flavorful hops, a nice level of spice and plenty of sweet malts to balance things out. Finishes dry and refreshing, this beer is nice on a hot Summer afternoon or as with this one on a dark Winter evening. I believe this beer started as part of their 100 Barrel Series but I am glad they kept it around and made it available in 6-packs. If you have not tried Harpoon Rich & Dan’s IPA yet pick one up, I don’t think you will be disappointed. Brewers Description: This beer is brewed with hops, a variety of malts, our proprietary yeast – the same yeast we’ve used since first brewing Harpoon Ale – and more hops. A lot more hops. Centennial and Chinook, and the dry hop addition of Falconer’s Flight add a multidimensional hop character, and the combination of Pale, Rye, Caramel 60, Flaked Rye, and Vienna yield a complex malt body that stands up to the spiciness of the rye and the pronounced hop flavor. 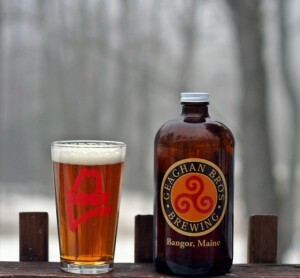 This is my second beer from Squam Brewing and it is another solid offering. This is a Rye Pale Ale, not sure where the rattlesnake comes from as we don’t have any in the Northeast. Thankfully as I am petrified of snakes. Beer has a very nice color to it, bright orange with an off white almost tan head. Aroma is subtle but has hints of sweet malts and some floral hops. Taste is fairly simple as you would expect from a pale ale with a touch more bread, Im guessing from the rye. 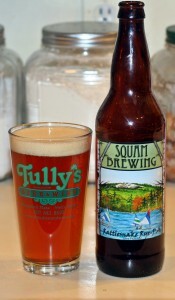 Overall this is another quality beer from Squam Brewing and something I would gladly drink again. Got this beer from Matthew Rand in exchange for something, not even sure what it was but always love exchanging beer with others. It sat in the fridge longer than it should have being an IPA but still retained much of the flavor. 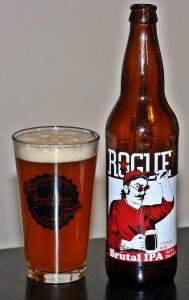 Rogue generally does a nice job with their beer. Color is your typical orange with an off white head, nothing too surprising here for an IPA but it does look nice. Nice mix of hop aroma with some pine, earth and citrus notes, not outstanding but solid nose. Taste is surprising smooth and easy to drink. Since it is named “Brutal IPA” I was expecting something big and harsh but that is not the case. This is a solid IPA with a fairly low ABV which makes it pretty easy to drink. You should try it, I doubt you will be disappointed. Brewers Description: An Imperial bitter with exotic traditional floor malts, citrusy, hoppy flavor, stupendous hop aroma. This one came back from Florida with Doug from Rock Island Hop Farm. We exchange beer quite often and he was down there for a week and brought back a couple of Cigar City varieties for me to try. I heard good things about this one so opened up it up shortly after receiving it. Color is a bit darker than I expected with a thick off white head. Aroma has plenty of citrus and tropical fruits. Taste is solid IPA with a nice amount of hops up front and then the sweet malts take over. It’s always interesting how some IPAs have the hops up front and other start with the malt sweetness. Overall I really enjoyed this beer and can imagine sitting in the hot Florida sun drinking a few of these. Thanks Doug for bringing it back for me. Brewers Description: Jai Alai, a game native to the Basque region of Spain, is played on a court called a fronton. Jai Alai players attempt to catch a ball using a curved mitt whilst the ball travels at speeds up to 188mph! Proving they have a sense of humor the Spanish dubbed this game, with its ball traveling at racecar speeds, “the merry game.” Tampa was once home to a bustling Jai Alai fronton but sadly all that remains of Jai Alai in the Tampa Bay area is this India Pale Ale that we brew in tribute to the merry game. The India Pale Ale style of beer has its roots in the ales sent from England to thirsty British troops in India during the 18th century. 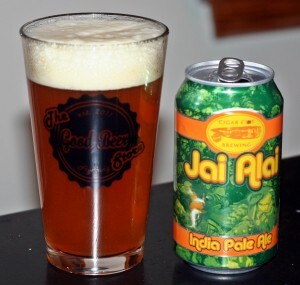 Pair Jai Alai India Pale Ale with Beef Empanadas, Deviled Crabs and other spicy dishes. Pours copper in color with notes of citrus and tropical fruit in the aroma. Flavor has upfront citrus bitterness with a hint of caramel and citrus and tropical fruit hop notes in the finish. Squam Brewing is a very small one man operation in Holderness, New Hampshire. Brewer/Owner John Glidden makes a variety of styles and all are solid beers. This one is the Golden IPA which does a nice job of describing the color. 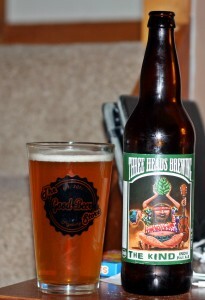 Also comes with a nice white head and a very appealing aroma even though it is not your typical IPA aroma. There is a nice mix of floral hops and some fruit that I can’t quite place; not the usual citrus, grapefruit but something else. Guess I need to eat more fruit so I can better place these aromas. Taste is solid for a single IPA with a nice sweet start and then plenty of citrus and floral hops. Well balanced and very easy to drink. 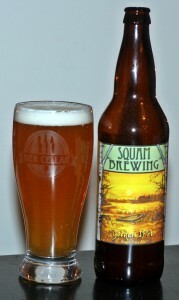 Overall I was very pleased with this IPA from Squam and look forward to trying the other beers John makes. 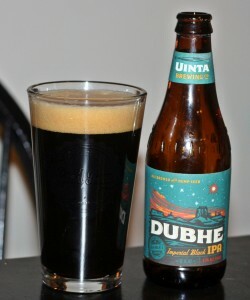 Uinta is new to Maine and they offer a nice variety of beer. This is their Imperial Black IPA which checks in at 9.2% ABV. I tried a couple of their beers at The Vault and ended up with this bottle from my brother-in-law. As you can see the beer truly is black with a nice thick tan head. Very nice looking black IPA and has a great mix of aromas with plenty of roasted malts, coffee, chocolate and some earthy hops. Taste starts with the hops; pine and a bit of citrus then an almost burnt coffee, chocolate taste comes in with a lingering bitterness. Overall not a bad beer but the burnt flavor seems a bit off. Worth trying but I still prefer regular IPAs over their black counterpart. Brewers Description: Named Utah’s Centennial Star in 1996, Dubhe (pronounced Doo-bee) illuminates the front of the big dipper from 124 light years away. Dubhe, also known as Alpha Ursae Majoris, is a red giant that appears orange in color and has a mass 4x that of the sun. Toasted, chocolaty dark malts align with an astronomical amount of hops. Picked this one up at Bier Cellar and enjoyed it a few weeks ago. I believe this was my first beer from Three Kinds and its not a bad start. The beer looks great with a nice copper color and thin bright white head. Aroma is ok with some pine and citrus but nothing too appealing. Taste is what you would expect from an IPA with a nice hop presence balanced out with some sweet malts. Again nothing great here but you will finish it. A solid single IPA but not sure I will get another. Brewers Description: Voraciously hoppy and not overly bitter, The Kind brings enormous aroma and maximum flavor. It’s like talking a walk through a pine forest and ending up at a citrus farm. This beer brings joy to the world, one sip at a time.